This will move the entire feature branch to begin on the tip of the master branch, effectively incorporating all of the new commits in master. But, instead of using a merge commit, rebasing re-writes the project history by creating brand new commits for each commit in the original branch. The major benefit of rebasing is that you get a much cleaner project history. The pitfalls of rebasing are discussed here. You can run git rebase --abort to completely undo the rebase. This will unwind all rebase changes and put the branch back in the state it was in before git rebase was called. 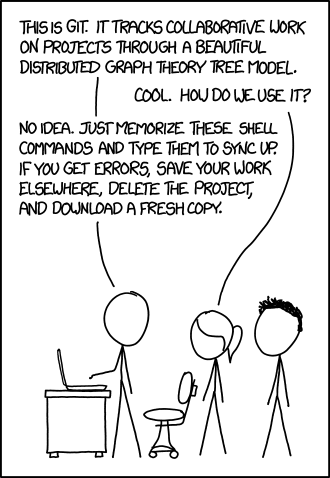 You can run git rebase --skip to completely skip the commit. Hence none of the changes introduced by the problematic commit will be included in the history. You can fix the conflict using the standard procedure for merge conflict resolution. With a work in progress, things are often in a messy state. So what if you need to switch to a different branch (just for a second!) to work on something else? Git won't let you because you have unsaved changes, and frankly you do not want to commit half-baked work just so that you can come back to it and fix it later. The answer to this dilemma is the git stash command. The repository now contains all the files that were in the specified subfolder. Although all of your previous files have been removed, they still exist within the Git history. You can now push your new local repo to the remote. Sometimes you may want provide a copy of your project to an outside member that does not have access to the repo on GitHub. The easiest way is to tar or zip up all project files. However, if you are not careful, the hidden .git directory will be included in the tar ball, too, which drastically inflate the file size and cause the recipient a lot of headaches if the files are being mixed with their own git repo. 12. Who f'ed it all up?